Why Have There Been So Many Contested Elections? : It's All Politics Election-related lawsuits have more than doubled since 2000. There has been at least one post-election litigation in every general or midterm election since 2000, with the exception of 2002. Legal experts blame the flawed election process and the fact that voters don't like their candidates to concede. Why Have There Been So Many Contested Elections? 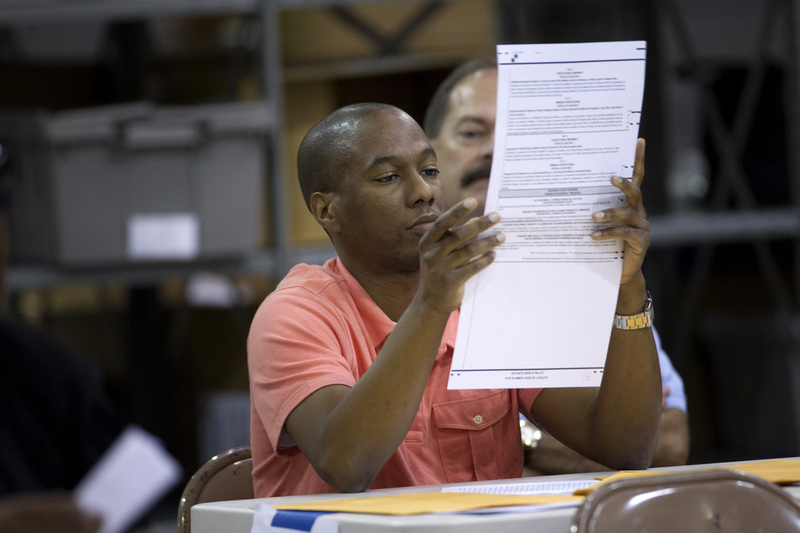 A Palm Beach County election worker counts ballots in Riviera Beach, Fla., on Nov. 9. Rep. Allen West contested the results of the election in Florida's 18th District for two weeks before conceding. Since 2000, the number of contested elections has more than doubled. After two weeks of dispute with St. Lucie County elections officials, Florida Rep. Allen West conceded the race for Florida's 18th Congressional District to Democrat Patrick Murphy on Tuesday. Allen's post-election battle was the most high-profile this year, but the phenomenon is by no means unusual. In today's political climate, candidates don't like to concede, even after the votes have been counted. Increasingly, they are taking their cases to the courts, says Joshua Douglas, an assistant professor of law at the University of Kentucky. In 2000, it was the presidential race between George W. Bush and Al Gore. In 2004, it was Washington state's gubernatorial race between Dino Rossi and Christine Gregoire. In 2008, Al Franken and Norm Coleman fought for more than eight months over the results of the Minnesota Senate race. And in 2010, Alaska Senate candidate Joe Miller filed three lawsuits in both federal and Alaska state courts after his race against Lisa Murkowski. West's battle is over, but there's still a chance that some of the 2012 congressional races will end up in court. In North Carolina, Republican David Rouzer has requested a recount in the race for the state's 7th Congressional District. These battles are becoming increasingly common. Rick Hasen, a professor of law and political science at the University of California, Irvine, School of Law, says election-related litigation (including pre-election and post-election litigation) has more than doubled in the period after 2000. And he says we're in for more in the future. Douglas says there has been at least one post-election litigation in every general or midterm election year since 2000, with the exception of 2002. Ned Foley, a law professor at Ohio State, says part of that may be traced to the unintended precedent set in Bush v. Gore, in which the Supreme Court decided that the different standards of counting ballots across Florida violated the equal protection clause. "We have a qualitative shift in both the psychological attitude about fighting over vote counting and the doctrinal ability to do so," Foley says. Part of that psychological attitude shift, Hasen says, is a result of the fact that we've learned that the way we run elections leaves room for error. In this year's election, voters faced malfunctioning voting machines in several states and confusion over a new voter ID law in Pennsylvania, and in Florida's Broward County, nearly 1,000 uncounted ballots were discovered in a warehouse after the election. "Candidates and campaigns know that our election system is fallible and there might be an error that could change the election results," Hasen says. They also know that the courts will hear their cases, Douglas says. "There are few logistical or procedural hurdles for a candidate who wishes to continue the fight," Douglas wrote in a blog post. "So long as a candidate or his or her supports can find the lawyers to take the case — and this occurred even in a relatively low-stakes judicial race in Cincinnati in 2010 — then the courthouse doors are open to candidates who are down after the initial canvass." The process is not only easy, Hasen says, but it is also encouraged. In a highly polarized political environment, more voters are less likely to want to yield to an opposing party. "Partisans in a close election will demand that a candidate not concede. Everyone remembers Al Gore conceding in 2000 and then having to take it back when it turned out Florida was too close to call," Hasen says. The end result, Foley says, is that preparing for post-election litigation has become a routine part of campaign strategy. "The lawyers are hired; they're ready to go. And from what I understand, the parties use the threat of this as a fundraising tool. They say, 'Give us money. We might need to fight this recount.' It's not purely a legal matter. It's a political tactic," Foley says.